Veteran night sky photographer Brad Goldpaint took many aurora pictures during three years of astronomical photo sessions. The image is featured in Goldpaint's night sky observing video, "Within Two Worlds." A spectacular new video from a night sky photographer has captured awe-inspiring views of the cosmos and some of Earth's most scenic wilderness locales. "I discovered my passion for photography shortly after my mother's passing while hiking the Pacific Crest Trail (PCT) 3 years ago," Goldpaint explains in a video description. "This time-lapse video is my visual representation of how the night sky and landscapes co-exist within a world of contradictions." The video is set to the serene instrumental tune "Believe in Yourself" composed by Serge Essiambre. It includes amazing scenes of the Milky Way, northern lights from scenic spots such as Crater Lake National Park in southern Oregon, California's Mount Shasta and the Painted Hills and Tumalo Falls in Oregon. Mono Lake in California, Big Bend National Park in Texas and auroras over Sparks Lake in Oregon, are also featured. Goldpaint is a professional photographer specializing in landscapes, seascapes and astrophotography and his images who has submitted images to SPACE.com in the past. In the "Within Two Worlds" video, he used Nikon cameras and equipment to capture his amazing night sky photos, but the images featured were taken without motion control systems. Since, Goldpaint posted the video on the website Vimeo on July 20, it has been watched more than 50,000 people times. 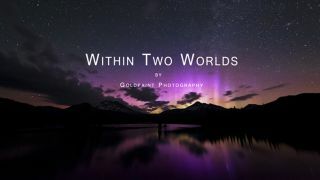 "I hope this connection between heaven and Earth inspires you to discover and create your own opportunities, to reach your rightful place within two worlds," Goldpaint wrote.